Pediatric neurological disorders are health conditions involving the nervous system, including the brain, nerves and spinal cord in children. Neurological disorders are diseases or injuries of the central nervous system that cause paralysis of any part of the body, and that affect children differently than they do adults. They are many different pediatric neurological disorders, some with names, many without. Some of the most common pediatric neurological disorders are epilepsy as well as muscular dystrophies. These disorders have different causes, many of them are congenital (present at birth) In many other cases, doctors are unable to determine what exactly causes a child’s condition. Regardless of the exact cause, all these disorders result in damage to the brain neurons. Neurological disorders are quite diverse, chronic, challenging to treat, and often disabling. They can be caused by many different factors, including (but not limited to): inherited genetic abnormalities, problems in the immune system, injury to the brain or nervous system, or diabetes. Many mental illnesses are believed to be neurological disorders of the central nervous system, but they are classified separately. Hundreds of million of people worldwide are affected by neurological disorders. Developmental milestones are determined during childhood by the average at which children achieve certain skills. Developmental delays occur when children do not reach their milestones at the expected time. Delays are a common result of many neurological disorders and can occur in one or more areas, which may include motor, speech and language, as well as social and thinking skills. Therapy has proven to not only be effective in the treatment of developmental delay, but a necessity, for a child with special needs, to perform his daily activities, and assist with his self-esteem. Though many kinds of therapy are available, the three main categories our project is involved with at this time are physical, occupational and speech/language therapies. A discipline that focuses on helping people achieve independence in all areas of their lives and can offer children with various needs, positive and fun activities to improve their cognitive, physical and motor skills as well as enhance their self-esteem and sense of accomplishment. A child’s main job is playing and learning and an occupational therapist can evaluate a child’s skills for play activities, school performance, and daily living activities and compare them with what is developmentally appropriate for that age group. OT’s can address children’s needs by working on fine motor skills so that children can grasp and release toys and develop good handwriting skills. Occupational therapists can also address hand-eye coordination to improve play skills, such as hitting a target, batting a ball, or copying from a blackboard. OT’s help children with severe developmental delays learn some basic tasks, such as bathing, getting dressed, brushing their teeth, and feeding themselves. OT’s help children with behavioral disorders with the coordination skills required, use of a computer, or increase the speed and legibility of their handwriting. They work with children who have sensory and attentional issues to improve focus and social skills. Occupational therapy helps children with disabilities be as independent as possible, accomplishing this goal using activities that are meaningful to the child, as well as the family. A physical therapist specializes in improving the development and function of large muscle groups working with the child on legs, arms and abdominal motor skills. 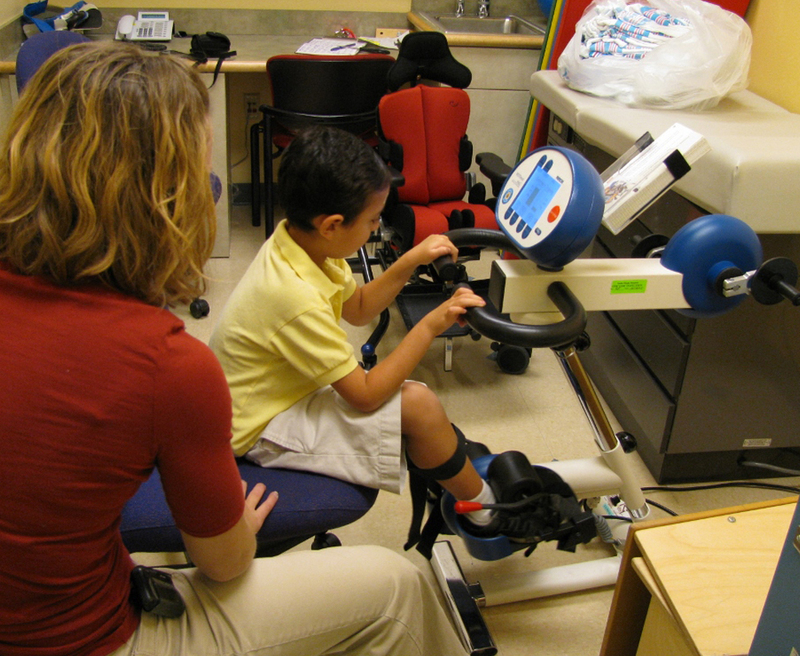 PT will help children learn better ways to balance, walk, kick, throw, or even ride a bike. Special exercises are used towards the prevention of musculoskeletal complications, such as intense weakening or deterioration of muscles due to lack of use or to prevent contractures of muscles, becoming rigid and fixed in an abnormal position. Therapists will assist the child with spasticity, in other words the interference in movement due to involuntary muscle tightness, secondary to damage in the brain. Early intervention will lessen the delays by facilitating certain developmental milestones. 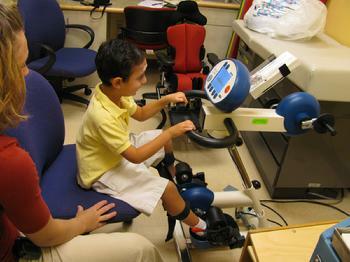 Therapeutic equipment that is used during treatment may include treadmills, bikes, trikes and specialized swings, as well as neuromuscular stimulation and ultrasound. Assisting children with special needs with daily living activities such as getting in and out of bed, in and out of a car, or ascending and descending stairs is really crucial to develop their opportunities. A speech and language therapist will assist a child with severe developmental delay, with his speech, language, cognition, voice, swallowing and the rehabilitative or corrective treatment of physical and/or cognitive disorders resulting in difficulty with verbal communication and/or swallowing. Communication may be verbal and includes speech (articulation, intonation, voice, resonance, fluency….) language (phonology, syntax, semantics….) but may also be non-verbal, such as facial expression and gesture. Swallowing problems managed under speech therapy are problems in the oral and pharyngeal stage rather than esophageal. Depending on the nature and severity of the disorder, common treatments may range from physical strengthening exercises, instructive or repetitive practice, as well as the use of visual aids and introduction of strategies to facilitate functional communication. Speech therapy may also include sign language and the use of picture symbols. S/L therapy is essential to children with developmental delay to promote and facilitate access and participation in communication, including the elimination of social barriers. and number facts about pediatric neurological disorders. Also called seizure disorder, epilepsy is characterized by repeated seizures, that last anywhere from a few seconds to a few minutes, and can occur as often as several times a day. They are caused by a strong burst of electrical energy in the brain. 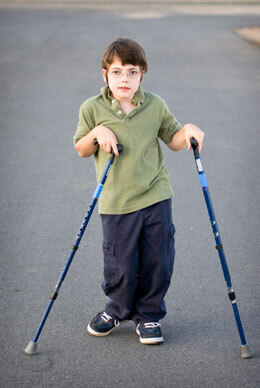 The term Cerebral Palsy refers to a group of neurological disorders appearing during infancy or early childhood, and that permanently affects the child’s ability to coordinate body movements. CP will cause muscles to be weak and floppy or rigid and stiff. The origin of CP Lies in abnormalities in the brain. A group of developmental disorders, where symptoms usually appear before the age of three. They are characterized by impaired social interaction, problems with verbal and non verbal communication, unusual and repetitive as well as severely limited activities or interests. Boys are four times more likely to develop autism then girls. Also called cleft spine or open spine, Spina Bifida is the most common disabling birth defect in the United States. It is a type of neural tube defect, which is a problem with the spinal cord or its coverings.It usually results in nerve damage causing paralysis of the legs, learning difficulties, as well as urinary and bowel problems. Almost one out of every 1000 children has Spina Bifida at birth. An uncommon to rare form of infantile spasms, also called generalized flexion epilepsy. The syndrome is often caused by an organic brain dysfunction, and generally occurs between the third and twelth month of age.The origins may be prenatal, perinatal or even postnatal. This term is used to describe a group of more than 30 diseases affecting function of the muscles. MD is a genetic disorder that gradually weakens the body’s muscles. It is caused by incorrect or missing genetic information that prevents the body from making the proteins needed to build and maintain healthy muscles. The most common dystrophy is called Duchenne MD. They are abnormal growths of tissue inside the skull or the bony spinal column, which are the primary components of the central nervous system (CNS) . Tumors may be cancerous or not. The CNS is housed within rigid, bony quarters, so any abnormal growth, whether benign or malignant, can place pressure on sensitive tissues and impair function. There are two forms of stroke, ischemic (when a blockage of a blood vessel supplying the brain occurs) or hemorrhagic (when bleeding occurs into and around the brain) Strokes do not only affect the brain but the entire body, often leaving the child with some form of paralysis. Strokes usually occur before the age of two. Pediatric strokes are rare, and occur for three out of every 100000 children.